Review of the mamaRoo – thumbs down! Today’s review is of a new wave baby product, that on paper, and on digital media seems pretty damn cool, but sometimes we over think things in this world. At its most basic level the 4Moms Classic MamaRoo is a baby swing. It’s smaller than your traditional swing, more like the size of a large bouncer. It does have a built in generic lullaby and nature player, it instead has a little area to place your ipod and audio input, as well as fairly decent built in speakers. It has a little display that allows you to pick between all the different speed and direction options. The mamaRoo is attempting not to just rock your child, but mimic the motion of a mother (or a father in our case). In theory it works great, the different options such as “Kangaroo” “Car Ride” are good and move in different motions. But I can tell you first hand, my daughter had no interest what-so-ever in the thing. I would mimic the motion of the mamaRoo…loved it. Set her in it and turn on…scream! The construction of the product is very well done and easily is not cheap. The fabric is nice and machine washable, though I’ve never washed it because my daughter has no interest. The mobile that is built in to the top falls down a little too easy, and the website makes a big deal about the fabric toy balls, they are really nothing special. I bought the plush version for my wife – $239.99, yikes. I thought it was going to be the best baby item by far, but instead it’s a major bust. It has been so ineffective that I had to call up friends of ours and borrow their 3 yr old swing – we didn’t register for one since I had already purchased the mamaRoo. So if you are looking for a slightly used mamaRoo, I have one available for you! Phil Hay and Sons Excavating Review – Thumbs Up! Build Your Own Industrial Pipe Shelf! Enter your email address to subscribe to HomeDaddys and receive notifications of new posts by email. Your email will not be used in any other way. House Is On The Market! Mophie Juice Pack Review (iPod and iPhone) - thumbs up! Review of Lorex Wireless Video Home Monitor - thumbs up! Review of the Franklin Sports Future Champs Youth Football Goal Post Set - thumbs up! 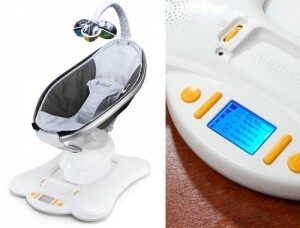 Review of the mamaRoo - thumbs down! Except where otherwise noted, content on this site is licensed under a Creative Commons License.